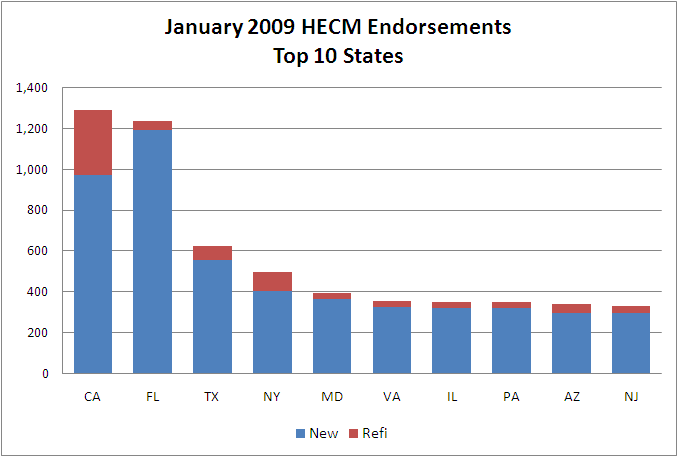 We’ve now seen three months of reverse mortgage statistics since the HECM loan limits were raised (and perhaps ready for another increase soon? ), so it seems like a good time to look at the early impact. 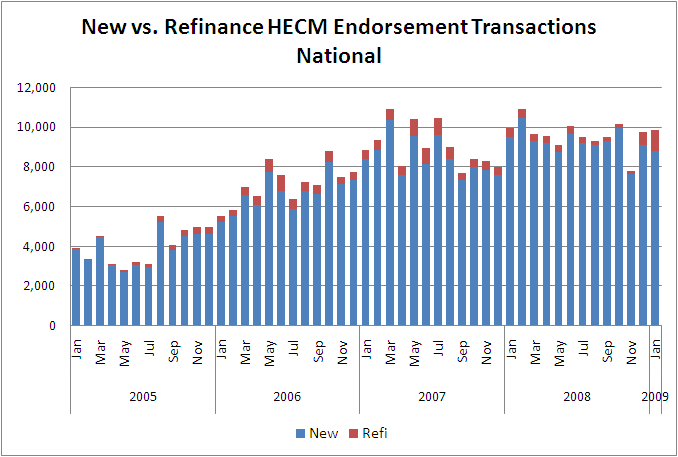 January saw the industry experience its largest ever volume of refinance transactions (HECM to HECM), topping a thousand for the first time (1,078) and well ahead of the second largest month (873 in July 2007). The chart above shows the bump in refinance transactions last month, with both December and January showing higher refi activity than any other month since July 2007. A more pessimistic observer might note, however, that volume for non-refinance loans was only slightly higher than last May, the lowest month last year. The story gets even more interesting when we look at individual states. California is always fun because it’s been a great leading indicator for the whole industry. 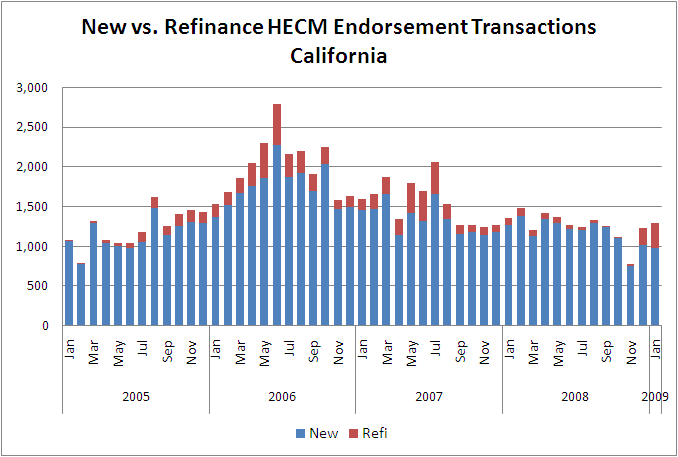 California has been in a downtrend for over two years now, and seeing non-refi volumes at 2005 levels. Despite the picture, we’re actually cautiously optimistic on the state this year, with competition trends starting to improve (active lenders back to 2007 levels), but that’s a topic for another day. Florida has virtually no refinance activity despite being the largest volume state (3% of volume vs. 25% in CA), which makes a very interesting comparison considering these two are usually lumped together as home price bubble states. This difference was good enough for California to take back the volume crown for one month at least. Moral of the story: National stats and trends are interesting, but the real money is in taking advantage of regional and local opportunities. And secondly, remember that refinance business is inherently unsustainable in the reverse mortgage business given an installed base of under 500,000 customers, so think carefully how you’ll invest your windfall from this refi wave into driving more sustainable volume through your franchise.